In today's hyper-competitive markets, sales people are under a lot of pressure. A sales person must not only sell a solution to a client, they must partner with the client to create the solution. This requires the ability to build trust with prospects and customers quickly. This level of partnership, co-creation, is not possible without the ability to engage people on both a rational and emotional level. Emotional intelligence is the competitive tool for sales people. 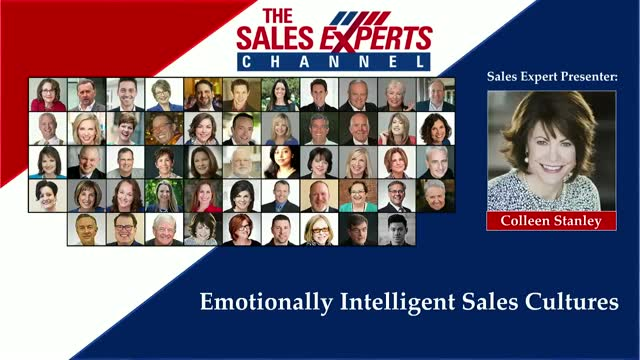 Colleen Stanley shares thought provoking and practical tips for incorporating emotional intelligence skills into your sales process. Learn how soft skills produce hard sales results. Understand the art and neuroscience of influence, sales and sales leadership. Discover why salespeople—and sales managers---default to fight or flight responses during difficult conversations. Learn the power of emotional self-awareness, the mega soft skill. Know thyself before you can know others. Discover how and why empathy builds trust and relationships. Leverage the power of truly ‘walking a mile’ in another person’s shoes. Gain insights on the importance of delayed gratification in building powerful selling skills and sales teams.